Seasoned homicide detectives are well aware that high-profile murder cases often attract numerous false confessions. They also know that unscrupulous officers under pressure from the media and other sources can coerce young, suggestible suspects to make false admissions. On December 6, 1991, the naked, bound-and-gagged bodies of four teenage girls were found shot to death at the I Can't Believe It's Yogurt! shop in Austin, Texas. This case captivated the Austin community and frustrated both police and the families of the four victims. The search for the killers resulted in numerous suspects. Eight years after the murders and under intense pressure to solve the case, four young men were arrested and charged with the crimes. Two of the accused were convicted, but the verdicts were later overturned on appeal due to gathering of false statements and coerced confessions. Today, the Austin Police Department insists that the four men arrested for the crimes were guilty of the murders, but the case remains open. 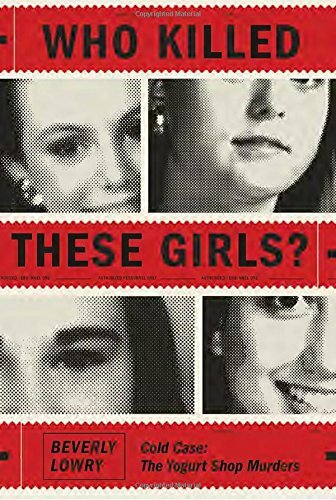 Beverly Lowry, the author of six novels and three works of nonfiction that includes Crossed Over: A Murder, A Memoir (2002), revisits this thought provoking and captivating case in Who Killed These Girls? Cold Case: The Yogurt Shop Murders. The author’s gripping examination raises serious doubts about law enforcements handling of the case and after expertly recounting the horrifying specifics of the murders, meticulously scrutinizes the countless blunders encountered by police during the investigation such as evidence gathering errors, inept and unethical interrogation practices, and failure to follow-up on even the smallest of leads. Although the central narrative of this book is most certainly the coerced confessions of the defendants and reversal of their convictions, this study raises many tantalizing questions, and the reader is left to contemplate highly controversial issues such as police misconduct and society’s role in preventing its youth from committing savage crimes. But in the end, four innocent young girls were murdered in cold blood and their killers remain at large and unpunished. Who Killed These Girls? Cold Case: The Yogurt Shop Murders is well-researched and thought provoking. It is a terror-filled thrill ride which is captivating from start to finish. It is highly recommend for anyone interested in true crime, unsolved murder mystery, or American law enforcement policies and practices.